Fully air conditioned/heated and spacious apartment with south facing terrace located within the small picturesque village of Cabanas. Our 2 bedroom, 1st floor apartment offers all you'll need for a wonderful holiday and is equipped with a fully fitted kitchen, comfortable lounge and dining area with access to the internet. Perfectly situated on the Quinta de Gomeira development, the apartment is adjacent to 1 of 4 swimming pools for residents use and close to the village and waterfront. Here there are numerous cafes and restaurants offering a good choice of food at excellent value. The 5 minute ferry-boat across the lagoon takes you to the beach where there are 3km of lovely golden sands. Cabanas is a delightful place to relax and if you enjoy walking, you can explore the coastline and the natural areas of beauty nearby. The historic village of Tavira is only 5km away and can easily be reached by bus/train. Other areas of the Algarve are easily accessed, including golf courses. Seville is approx 2 hrs by car. 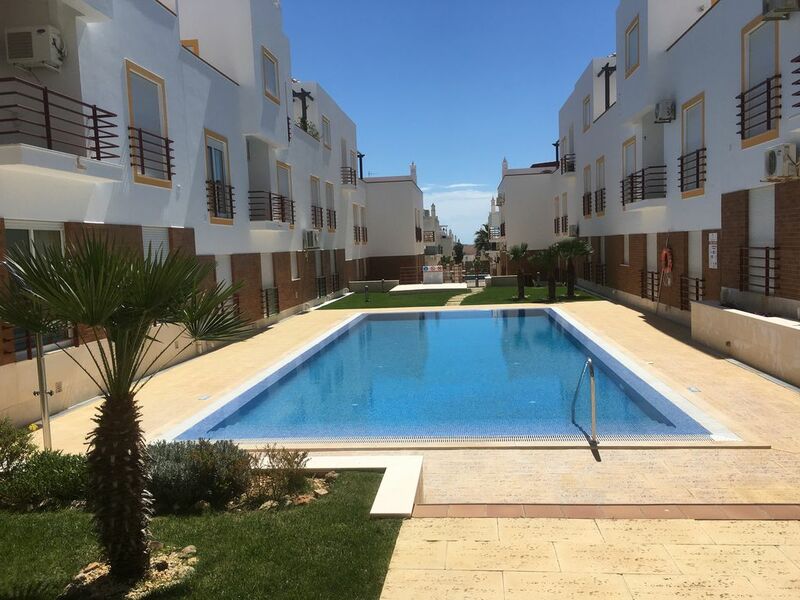 We have a tourist license for renting out our property which means that the apartment has been inspected by the Portuguese authorities and complies with all regulations. Bathroom with bath/shower over, WC, sink with illuminated mirror and vanity unit and bidet. There is a linen and towel change every 7 days. Beach towels and pool towels are not provided. Please do not take the towels we provide for the bathroom out of the apartment. Due to Cabanas being a small fishing village, internet connection/speed cannot always be guaranteed. Large open plan, comfortable lounge/ dining room. Sofa, 2 lounge chairs and dining table with 4 chairs. Includes TV with free satellite (limited English channels) DVD player, CD player. Selection of DVDs/CDs/games and books. Air conditioning/heating. Cooker, hob and extractor, granite worktops, fridge/freezer, washing machine, microwave, toaster, kettle, iron and ironing board, clothes airer and ample kitchen utensils. Sliding patio doors onto the balcony. A selection of books are available. Our balcony is accessed from the kitchen and has a table with 4 chairs and there are other sunchairs that can be used, to relax in the sun. There are 5 golf courses a short drive away. Benamor is approx 5 minutes away, par 71 and has a driving range and panoramic views over the mountains. Quinta Da Ria is approx 10 minutes away, par 72 with excellent sea views. Quinta Da Sima is approx 10 minutes away, par 72 is a fairly challenging course. Castro Marim is approx 25 minutes away, par 72 near the Spanish border. The highly rated Monte Rei championship course designed by Jack Nicklaus is approx 20 minutes away and a par 72. We've enjoyed lunch and a coffee on the terrace here, overlooking the fabulous views of the golf course and countryside, the service was excellent and very friendly. The Quinta Do Vale golf course designed by Seve Ballesteros, is located near to the Spanish border approx 25 minutes drive. Please let us know if you require more details as golf clubs etc can be hired locally. There are 4 pools available for our guests. They do not provide sunbeds around the pool but you can hire chairs during Jul, Aug and early Sept for approx 1 euro. Notes on accommodation: Video entry phone. Both bedrooms and lounge have patio doors with roller shutters for shade and extra security. The apartment is no smoking and pets are not allowed. Cot/high chair available on request for additional charge. Air conditioning units in each bedroom and the lounge, also provide heating in winter months - controlled by handset. Along with gas/electricity and water, all are included in the price. Outside: The south facing balcony has a table and 4 chairs and has ample room for relaxing, including sun umbrella and screening for privacy. Picnic and beach accessories available for guests use. There is plenty of parking in the spaces in front of the entrance door to the apartment. There are 4 shared pools (not heated) set in landscaped gardens Access to the pools is only for those residents in the apartments on Quinta De Gomeira using electronic swipe cards - provided in the apartment. A children's play area/local bar and restaurant are available on the development. Cleaning / Towels / Linen / Maid service: Towels and linen included in the price. Guests are asked to please provide own towels for pool and beach. Our family had a great stay at this property. The apartment is a good size and was equipped with everything we needed for our stay. The kids enjoyed the beach which is a short boat ride away and the apartment itself is close to the bars and restaurants of Cabanas. We would definitely book this property again. This apartment is in just the right position in cabanas, it's quiet but within a very short walk fo restaurants, train station and the beach. The apartment is equipped with every possible thing you could need it was Ike being at home but in the sun ,even a sea view from lounge window and balcony. We would certainly book it again , I have also told friends how brilliant it was. Great apartment. The perfect getaway. Glad you enjoyed your holiday, Duncan, with your family and thanks for sending us the photo showing your son playing on the balcony. It's nice to know our guests find places to enjoy in Cabanas and our apartment also adds to having a great holiday. Hope you can return in the future, thanks for your kind review, Karen and Steve. Great location in Cabanas this apartment was one of the best we have stayed at in our 6 visits to this lovely village. It was well equipped, comfortable, good size and with a sunny south facing balcony. We received service from Karen who owns the apartment and a friendly meet and greet from Sue who looks after it for her. Went to Tavira Island beach at last and sorry we hadn't been before, it is fabulous and a lovely 20 minute ferry ride down the river. Favourite places to eat this time were the Wine House Tapas Bar for lunch mainly but also just for a drink as the only place that seems to have German lager on draft! Excellent food also at the Cabanas Brasserie, O Escahlo and Sons da Ria but a bit disappointed this time at Sabores da Ria which had previously been our favorite restaurant. Would recommend this apartment to anyone staying in the area. Dear Linda and David, thanks for your very kind review. We are really pleased that you enjoyed your stay in Cabanas/our apartment. Thanks for taking the time to review our property, Karen and Steve. Thank you very much for your very kind review. We are really pleased that you enjoyed your stay in our apartment. Appartement très bien équipé accueil chaleureux et tavira est un très bel endroit à découvrir ! Logement très agréable bien aménagé cosy et très bien équipé. Une très belle surprise ! Thank you for your very kind review and glad you enjoyed your holiday in Cabanas. Close to the Ria Formosa, a nature reserve, the area is ideal for walking/bird spotting/cycling and various water sports. There are also historical sites to visit. The apartment is located approx 5 minutes walk from the waterfront where local fishing boats take people to the 3km unspoilt beach of Cabanas through the day in season. The boat costs approx 1.50 euros return. There are parasols and sun beds for hire and a bar over on the beach. A short drive down the road will bring you to Manta Rota where you can park and walk onto the beach and there are also many more beaches along the coastline to explore. Cabanas is approx 40 mins drive from Faro airport, the nearest international airport. Flights also available to Lisbon/Seville. Lisbon is approx 2.5hrs drive and Seville is approx 2hrs. Taxis from Faro airport will cost approx 45 euros each way. There are bus/train services between Faro and Cabanas and the local area. There is also a shuttle bus service-please ask for more details. The local train station in Conceicao is a 15 min walk from the apartment. The Spanish border is 25 mins drive away. The motorway A22 (currently a toll road payable at local post offices) now runs the length of the Algarve making the western Algarve very easy to explore. The historic town of Tavira is approx 10 minutes away by car. Zoomarine - theme park and zoo near Albuderia is approx 45 minutes by car and Aquasplash about 30 minutes away. Faro is approx 35km west and the Spanish border is about 25km east of Cabanas. Cabanas has its own small local market selling fresh fish/meat/fruit and veg. There is a local bakery and a couple of butchers as well as a few small supermarkets, that are open daily to approx 8pm. ( Sunday hours are more restricted) There is a bank with a cash machine and a post office. There are a wide variety of restaurants/bars offering freshly produced local dishes. ‘Escalhos’ a local bar, is run by a friendly Portuguese family, providing lunches/snacks/evening meals. The prices are very reasonable, a bottle of beer/glass of wine for around 1.5 euro (2015 rates) and also free WiFi access. ‘Pedros’ restaurant located on the waterfront, offers lunches and evening meals and is very popular at weekends and peak times. The ‘Ideal’ restaurant, located in the heart of the village is a lovely traditional Portuguese restaurant. We have enjoyed meals at both with family and friends. The Sabores Da Ria restaurant has stunning views over the Ria Formosa some of our guests have commented on enjoying an evening meal at this restaurant. The Jolly Sailor restaurant which is just up the road from our apartment is also another location for evening meals - mainly serving meat dishes with 'steak on the stone' being a popular choice. These are just a few of the restaurants available and some also provide a take away service. There are more tourist attractions that can be found on the Western Algarve that can be reached either by the use of a hire car or by booking a tour bus. Trips to Seville and inland Portugal are also an option as well as boat trips/diving that can be organised locally. Bikes can also be hired. We are happy to provide you with more details as required. Booking Notes: £50/75 euros deposit and remaining balance to be paid 8 weeks prior to arrival. Any breakages/damage should be replaced or paid for locally. Changeover Day: Changeover day is flexible. Usual time for vacating apartment is 10am and arrival time is 3.30pm (depending on incoming guest this can be changed). Notes on prices: Prices shown are for 4 people, enquiries for 2 people are very welcome. Euro prices available on request.